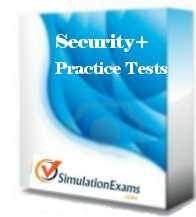 SimulationExams.com, a leading provider of practice tests, released CompTIA® Security+ SY0 501® practice exam simulator. The practice tests include 350+ questions with detailed explanation for each question. The exam sim provides an environment that is similar to the actual exam and facilitates taking the actual exam with confidence. Question types include multiple choice questions (MCQs), drag-n-drop (DnD), Hotspot, and others as normally encountered in the real exam. Other CompTIA® practice tests http://www.simulationexams.com/comptia.htm available include A+ Essentials, A+ Practical Application, Server+, and Network+. Cisco practice tests available include Cisco Certified Network Associate (CCNA 200-125), CCNP Route (300-101), CCNP Switch (300-115), CCNP TShoot, CCDA and CCENT. The Exam Sim Engine provides an integrated test environment (ITE), wherein, you will be able to check for upgrades, and activate the full version using program interface soon after purchase. You may also download the demo versions of any other practice tests offered by SimlationExams.com using the ITE program interface. The Security+ certification is awarded by CompTIA®. The exam is intended for candidates having experience in configuring and managing computer and network security for small and medium organizations. Seucrity+ Certification is one of the most widely recognized certification in the field of computer and network security. Security+ exam is targeted for computer service technicians and network security administrators. Read more about Security+ Certification exams or just download trial version of Secplus practice tests. Disclaimer:SimulationExams .com a group website of Anand Software and Training, and is neither associated nor affiliated with CompTIA® or any other Company. Security+®, A+ and Network+ are trademarks of Comptia® organization. All trademarks are duly recognized.